The time had come to introduce Mrs Hatt to the Football Weekend experience. Readers of the blog will be aware that on an annual basis, myself and my Dad pay a visit to our old pal Theo who lives in a town called Duiven, situated in the Gelderland region of Holland, just East of Arnhem. The trip involves as much football as we can squeeze in, with beer filling in the gaps between. It started out as a weekend, but has now stretched out to almost a week. It’s a test of the resolve, that’s for sure. Theo has been asking for some time now for me to take Mrs H over for a visit, and with our Wedding only a month away, it seemed like a great place to go for our final break together before the nuptials. Initially the plan had been to go out and watch Borussia Dortmund play against Augsburg, but as I sit and write this on the Monday evening after our return, the aforementioned game is currently on the TV, having been moved due to Dortmund’s European commitments. Not to worry though, with Friday evening being Jupiler League night in the Netherlands, the choice of games was pretty comprehensive. We didn’t want to go too far though, so the obvious option sat just over twenty minutes away in the nearby town of Doetinchem. 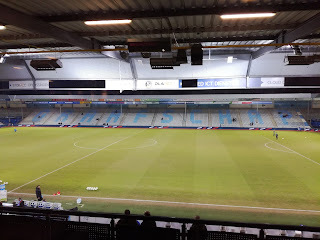 It was over ten years ago now that I first became familiar with De Graafschap, ironically we went to see them play against Helmond Sport that time as well. 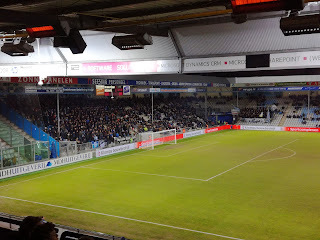 My memory of the game was listening to the home supporters singing “We’re farmers til we die”, with the club being nicknamed ‘Superboeren’ or ‘Super Farmers’. 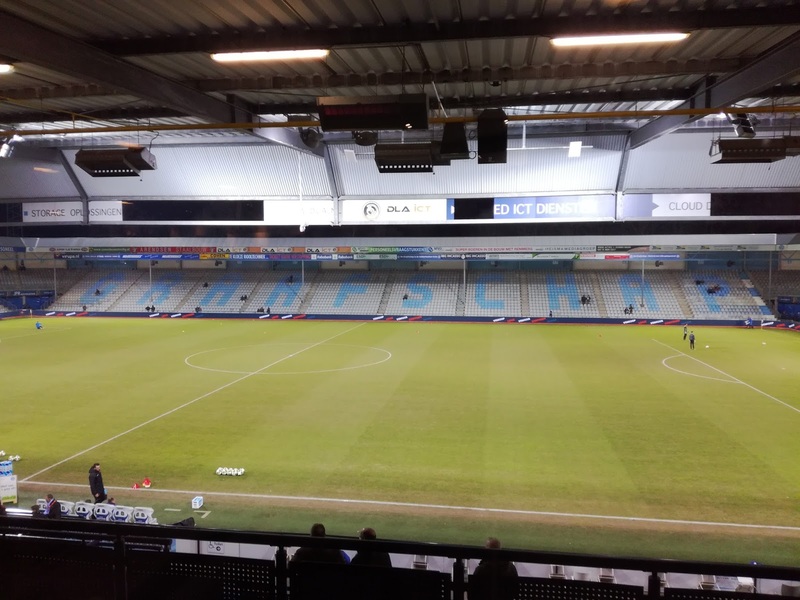 The history of De Graafschap, which translated means ‘The County’, is not an overly remarkable one. They haven’t won any silverware of note, and in terms of their recent performances, since 2003 they’ve been up and down from the Eredivisie like the proverbial yo-yo. 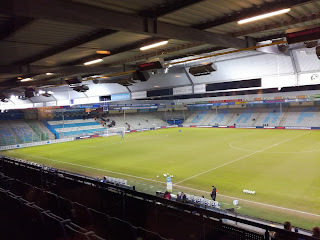 But that said, they have an impressive stadium and the support is very good, certainly by Dutch standards. Doetinchem sits to the East of Arnhem and is very close to the German border. The day was spent in the nearby historic town of Zutphen where much culture was imbibed before we found a bar with its own brewery. Post drinkies, we made our way to Farmer Land and found a very nice bar / restaurant in town where once again the local culture was soaked up in abundance. Theo had played a blinder, a car park space smack outside the main stand was n't too shabby, with the added bonus of tickets for the executive lounge, which included a free bar. I was as happy as a pig in a swamp, Mrs H, after freezing to death in the Baltic temperatures that are sweeping from Siberia, was also suitably impressed by the fact some luxury was about to be afforded. 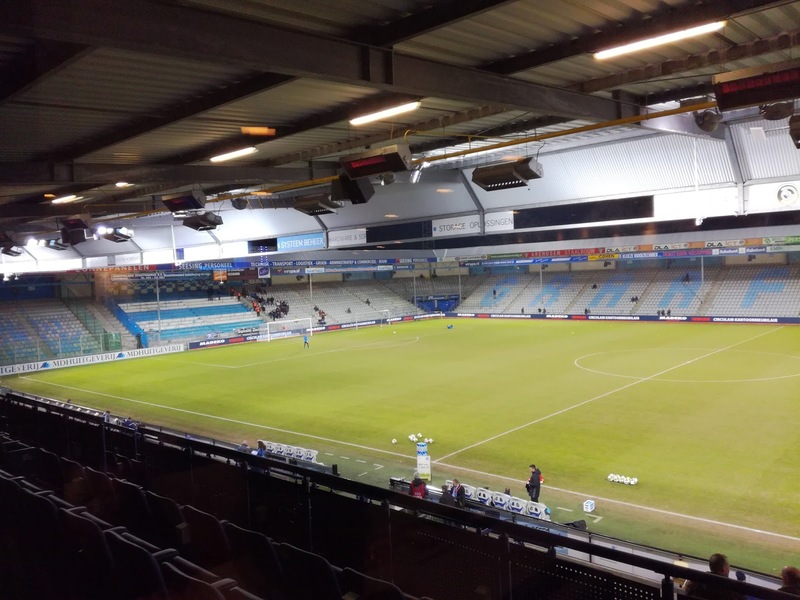 The stadium is lovely, notwithstanding the excellent corporate facilities, it has seated stands on all four sides barring a small area of terracing that houses visiting supporters. It is the type of stadium that is typical in the Netherlands, very tidy, well kept, and conducive to a very good atmosphere. 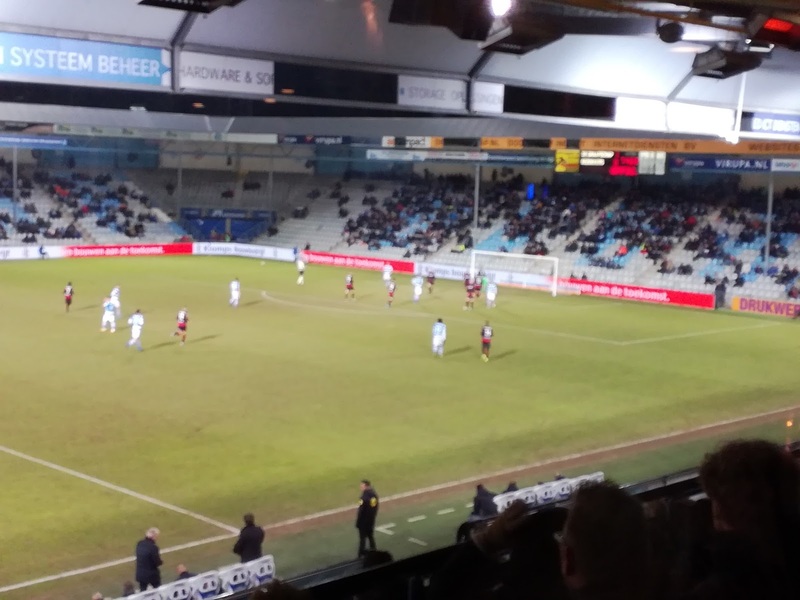 The stadium is called De Vijverberg, and it’s located close to the railway line that serves Arnhem and Winterswijk, but despite being close to the city centre, it’s located in a wooded park area so the approach has a very rural feel about it, as is befitting of a club with its nickname. After enjoying some of that lager that the Dutch only like us to drink when it’s ready, we made our way to the padded seats located underneath the heaters that lined the stand roof, they were seats that offered a fine view of the action, but ninety minutes later our view was that the seats would have been better served facing the opposite direction, because I’m sure staring at a wall would have been significantly more entertaining than the fare on offer. 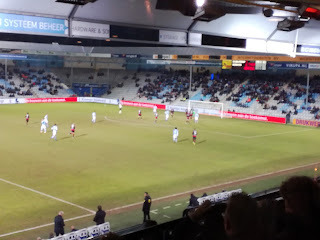 Mark Diemers scored the only goal of the game for the hosts in the 13th minute, while a chance to make it 2-0 with just a couple of minutes remaining went begging when Daryl van Mieghem saw his penalty saved. 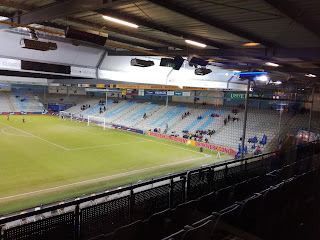 Helmond, who sat next to bottom prior to kick off didn’t create anything of note, while the ‘Superboer’ maintained a play-off place, without having to move out of second gear. 7,500 pitched up to watch it, which was around a thousand under their average this season, and only NEC Nijmegen are better supported with around 9,500 regularly watching the league leaders. Putting it into perspective, Helmond Sports average 1,600, whereas nine sides average less than 2,000 through the gates, including all of the reserve sides of the Eredivisie clubs who compete in the division such as PSV, Ajax and AZ, who quite often see crowds in just three figures. Getting away wasn’t a problem after the game, and by the time the heaters in the car had got to full operating temperature, we were back on the motorway with Duiven on the horizon. With temperatures dropping further still, it was the kind of night where your average farmer would be worried about his flock. No such worries for the Super Farmers of Doetinchem though, they could sleep easily knowing that another promotion remains on. 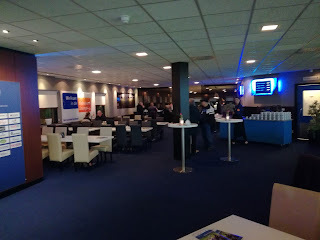 Now that brings me onto the Dutch play-off system, I won’t try and explain it to you, because I still haven’t after all of these years managed to fathom out how it works! De Graafschap do seem to have fathomed out how to win it though, having got promoted via this method twice before in recent years. They’re not daft these farmers you know!